The previous week’s 1-5 drubbing at the hands of Philadelphia felt like rock bottom for the floundering Loons. Then came this past weekend, where the team returned home and collapsed against a woeful Colorado Rapids team that had previously lost seven consecutive matches by a combined score of 1-22. 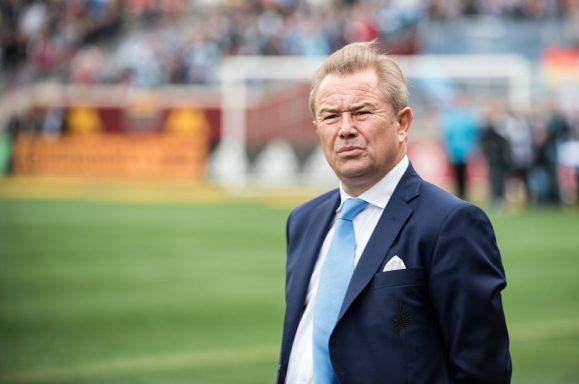 That defeat sealed Minnesota’s 0-4 record against San Jose and Colorado, the two worst teams in the league, who have earned a quarter of their points at United’s expense. Although Minnesota have been out of the playoff picture for a while, there have still been plenty of reasons for the team to play out the rest of the season and make these games meaningful. The problem is, they’re not doing a good job of taking advantage. One objective for the team should be to get younger and start giving its younger and greener players some opportunities. I’ve spent the last couple Matchday posts hammering the coaching staff for inexplicably showing no interest in doing that. The other big objective should be for growing the fanbase and generating excitement headed into next year’s big second impression at Midway. Unfortunately, as we’ve seen in the past few weeks, there seems to be not a lot of interest in doing that either. Fifty thousand fans are expected this coming weekend against the LA Galaxy, and the Loons are entering the match on their worst run of form since March of last year. Yet by all public evidence, nobody in the team has the slightest problem with this. This dreadful season has been met with either silence or complacency from the front office, who seem fine with a C- season, because it’s still a passing grade. The team’s leadership may have their reasons for supporting the technical staff. There may be mitigating circumstances behind the scenes that the public is not privy to, which argue in favor of keeping everyone in their jobs. I can accept that. What’s not acceptable is a lack of any kind of acknowledgement that the team has not delivered on expectations in this second year. What’s not acceptable is the constant insistence that the team has improved, when all available data suggests it has on the whole gotten slightly worse. What’s not acceptable is the general lack of accountability or responsibility for these mistakes. Minnesota supporters are not asking a lot here; expectations with regard to net spending are already low. But it shouldn’t be too much to ask for a team on the field that is, at minimum organized. It shouldn’t be too much to ask for a technical staff that doesn’t point to injuries that happened last year to excuse its errors. It shouldn’t be too much to ask for a club leadership that isn’t afraid to express some ambition. I’ve been mulling over Chris Wright’s inexplicable heel turn for a week now. The former Timberwolves executive is highly regarded in his profession. It’s his job to broadly supervise the work of the technical staff, but not his job to make decisions for them. Surely he knows that another year similar to this one in the first season at Cloud City would be a bitter blow to a Loons club who are still minnows in a tough sports market. So go out and say (and then double down on) obviously dumb things like the “passing grade” comment? Early this year, I had a surprising opportunity to speak directly and privately to MLS Commissioner Don Garber. In our brief exchange, I decided to speak to him about the Columbus Crew, and make the same argument that I made in these pages: that the threat of the Crew moving to Austin was perceived by Minnesota fans as a threat to our club as well. Why should fans in similar markets to Columbus invest their time and energy into their clubs if they could be so easily whisked away? I won’t go into detail, but the Commissioner’s response, while diplomatic and noncommittal, reassured me that he understood what I had said. I cannot claim to have always been perfectly sanguine about the state of the Crew this season. But I have long believed that the league was more interested in keeping the Crew in Columbus than they ever let on publicly, because I had faith that they were not acting out of stupidity or arrogance (now Anthony Precourt, on the other hand…). I think about that memory now, because I’d like to believe something similar is at work with Minnesota United. I have never spoken with Chris Wright, I have no idea what internal deliberations are like within the team’s front office. I think the public messaging this season from him and Dr. Bill McGuire has been truly out of touch, but perhaps they are simply making strenuous efforts to avoid diminishing their team during the season. I dunno, I can’t explain it in a positive way otherwise. 5. Ángelo Rodríguez had just a nightmare night. The misery started early, with a miss one-on-one on Tim Howard in the third minute. It continued as the hold-up man was unable to link up with his teammates in the attack, ultimately ending with an 11/21 passing night. But the worst moments were on Minnesota’s goals, both of which were called back because the Colombian had been offside in the build-up. What was so bad about both moments is that they were truly careless. Neither was the result of Rodriguez mis-timing a run, or another player mis-timing a pass, or the defense stepping up or something. Both times, Rodriguez was intending to receive a pass and hold up the ball, which is what happened. It’s just that he was offside. Why? Who knows, but he cost the Loons at least a draw, and quite possibly three points. What would’ve happened had he scored early, or not caused the first goal to be called back? We’ll never know, but yikes. 4. Alexi Gómez wasn’t much better. The Peruvian winger didn’t have the standout bad moments that Rodriguez provided, but he was once again more or less invisible in the attack. It’s now been an astonishing 1,322 minutes of MLS play without a goal or assist for Gómez. He has taken 22 shots, with only 7 on target (interestingly, Ángelo Rodríguez had identical numbers). Eventually his role was taken over by Frantz Pangop, who contributed nothing either. But at least Pangop has a goal for the Loons, if only in a friendly. Maybe the Cameroonian could get at least a token look? 3. Fernando Bob is not the defensive midfielder Minnesota need. I like Bob’s calmness on the ball, which reminds me of Juliano Vicentini. But defensively, he’s not what the Loons need. He’s especially lax in defending the area atop the box, where the Loons allow a tremendous amount of shots. I’ve often noticed his failure to track runners that often left his partner in midfield, Maximiano, exposed. Rewatch the match starting at 48:05 for an egregious example that leads to a good shot for Colorado. 2. Again, Wyatt Omsberg did not play, despite the absence of Francisco Calvo. Is Calvo a LB now? Sure. But it’s not hard to figure out a way to get Omsberg into the line-up. Play Michael Boxall as a RB, where has occasionally been deployed with not a lot of problems this year. Play Eric Miller as a LB. Install Omsberg in central defense. If there’s a will, there’s a way, and it’s completely clear by now that Adrian Heath just doesn’t think it’s important to get his young centerback competitive minutes. Instead, those minutes went to Marc Burch, who actually had his best game of the season, but is 34 and probably won’t even be with the Loons next year. Am I going to keep harping on this? Yes, yes I am.